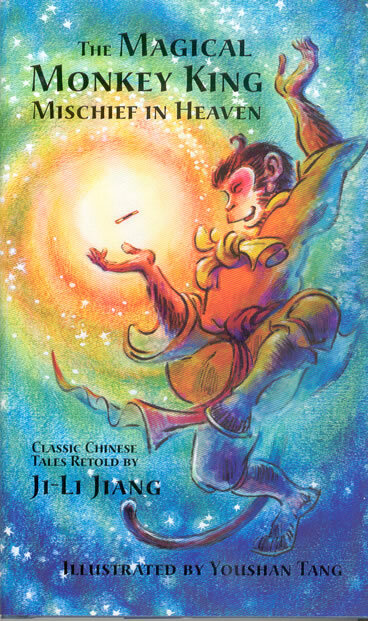 In China, thousands of years ago, amidst a terrible storm, a stone monkey comes to life. "Monkey," as he is known in the story, then created many adventures that have magnetized us for generations. The Magical Monkey King is an adaptation of one of China 's favorite classics, Journey to the West . In this first episode, we learn how Monkey is born and becomes Monkey King, how he charms and annoys Jade Emperor, the ruler of the universe, and what happens when he made a havoc in heaven. A fairy tale of triumphs over adversity as Monkey King becomes more human. His magical powers, his cleverness, as well as his mischief and fearless rebellion against authority make him a favorite character for children all over the world. "I enjoy your story the Monkey King, but don't like having to wait for Friday to read it because I love it so much! I can't believe your story is ending so soon! " At one school she visited, the students surprised her (and me) with a play of the first chapter of the story (complete with students playing Chinese music). The story came to life! It was incredible and everything I had envisioned when I started publishing the serialized stories--not students just "reading" the story, but experiencing it as well. Suddenly, there was an earth-shattering blast. Craaaack! The huge rock on the mountaintop split apart and fell to pieces thousands of feet below. All that was left on the peak was a black stone egg. For nine days and nine nights, the egg burned and burned. On the tenth day the fire died out. The egg, too, was gone. In its place—on the very top of the mountain—stood a small stone monkey.